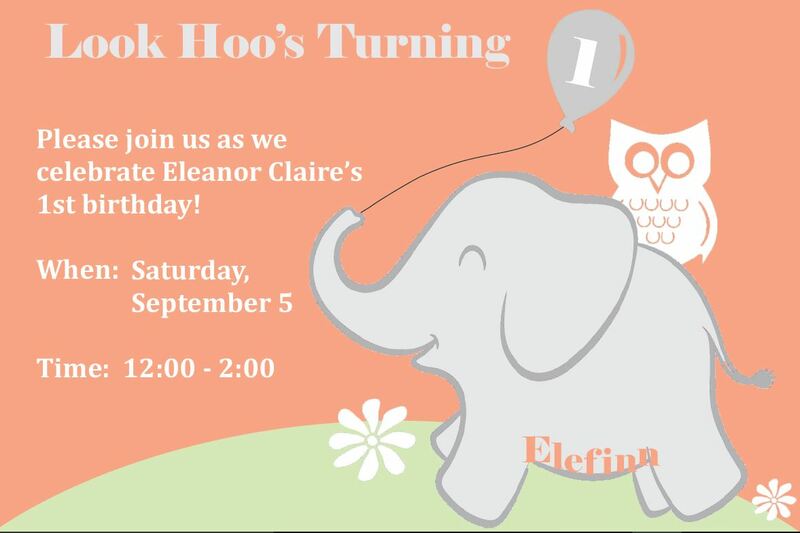 Eleanor was had just turned one when Ted was taken from us. An age that gave many the audacity to say that she’d recover quite quickly from the loss. But like many things that have been uttered without experience to validate, this proved untrue. A couple of months before her birthday, Eleanor started to really began her bonding with Ted. We had read that breastfed babies tended to be more mom-focused for their first several months, understandably since that’s their sole source of nourishment, but then they begin to realize there’s another parent – and in her case, a curiously fun and interesting one. One day when she was around eight months, I led a phone conference for work – something I usually did from the office but on this day, it was from home. 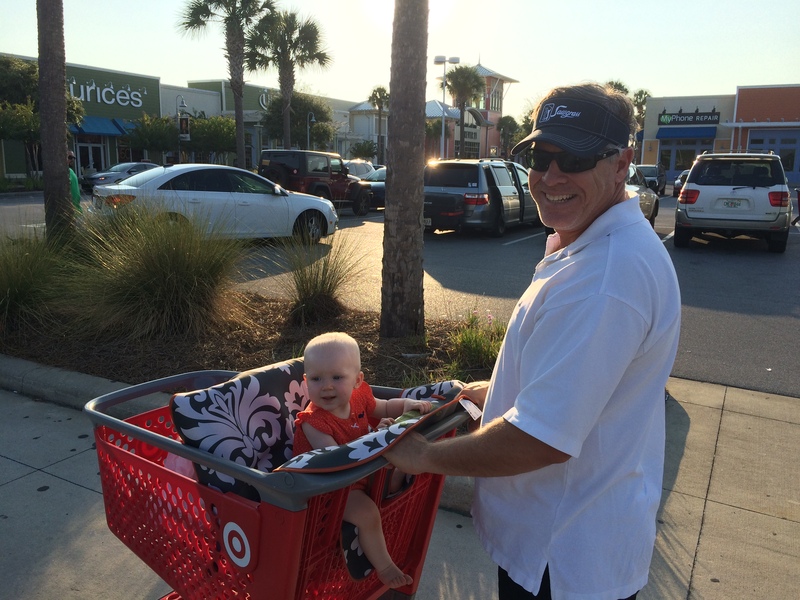 Because I needed the house to be free of baby noises, Ted decided to take Eleanor on their first daddy-daughter date. He came back beaming about how well she did and how much fun they had. 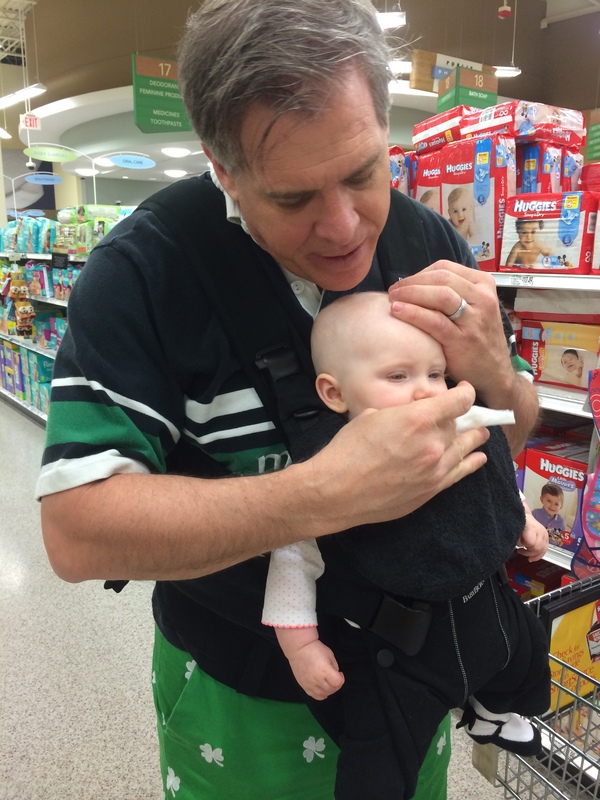 He walked around the store with her strapped to him in the carrier, feeding her a baby food pouch. Now, Ted routinely consumed food from the grocery store while he was still shopping, so it’s no surprise that he introduced Eleanor to that same laissez-faire way of being. My being an over-explainer with a guilt complex, I’ve never felt comfortable doing so myself, but I’ve carried on that tradition with Eleanor when we go grocery shopping. I let the checkout clerks assume I had to give her something to be content, but I know it’s our hat tip to Ted. Their field trip launched a routine for them. He took her on one each week – typically to Target or the hardware store (he said she really liked the Halloween decorations that were starting to fill Lowe’s on one of their last outings together). He loved carrying her on his chest and she loved seeing the world from that vantage point. But it was more than that – she just loved being with him. 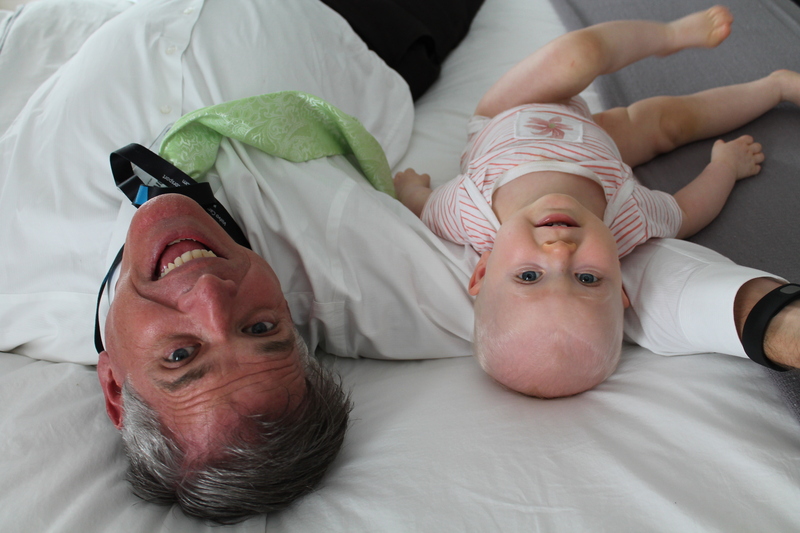 Daddies bring such a different set of feelings, comforts, and experiences to a child’s world – and that was very much the case with Ted. He brought a sense of exploration while still surrounding her with the same feeling of protection and safety that he’d always given me. He gave her boundaries but with the freedom to roam, test, and experiment within those parameters. He delighted her with his jovial nature and childlike manner. While he said she seemed most content when the three of us were together, there was no question how she felt about his comings and goings. She’d stand at the glass front door and wave goodbye to him in the morning. And she’d return to that spot and wait for him to drive up in the afternoons. It was his rule that when he was home on the weekends, he’d be the one to get her from her naps because it was, “important that she knew who her daddy was.” She’d squeal when she saw it was him coming in her nursery, and jump at her crib rail waiting for him to pick her up. I had never seen her crawl so fast as the time he returned from being out of town for two nights. Eleanor and I had been staying at my mom’s while Ted was gone, so he came directly to her house when he got back in town since he didn’t want to go longer than he had to without seeing Eleanor. We stayed at my mom’s for the first month after Ted was killed so it was those same floors on which she’d stop crawling, put her head down, and begin to cry when after days and weeks of her calling for him, he wasn’t returning. The day we moved back home was the first time she had been to the house since we left for the hospital thinking he was still alive. She was so happy as we came up to the front door and crawled into every room, looking for him. 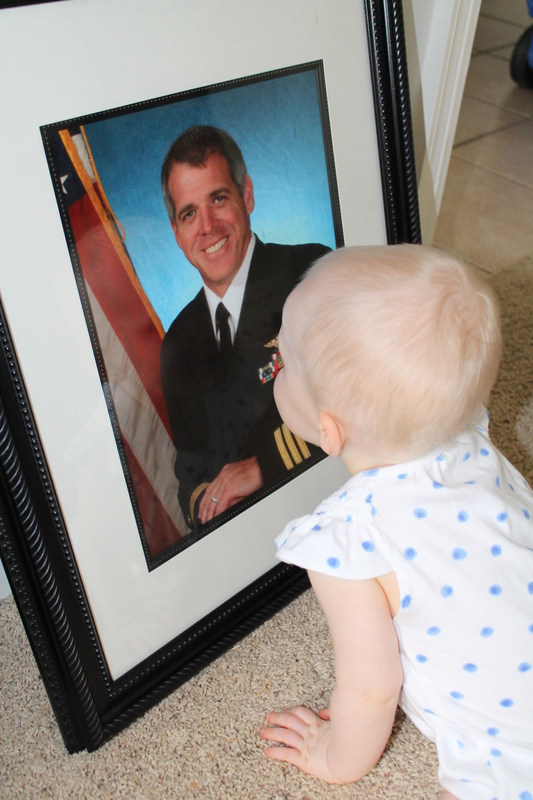 When she checked the last room and didn’t find him, she sat in front of his Navy portrait that we used for the funeral and stared at him. For months, when I’d go into get her from her crib in the morning or after a nap, she’d see it was me and begin to cry, saying his name through the sobs. 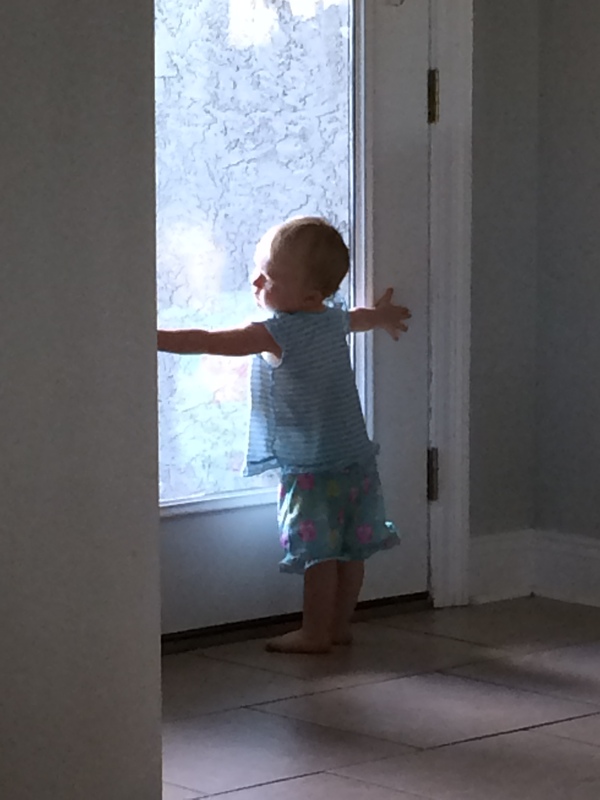 The same would happen when someone would come to the front door, she’d crawl to it with all her might, saying, “daga, daga, daga,” only to find that it was not her daddy. For months, she’d regularly go to the front door and look out, waiting for him to drive up. She now only does it from time to time, but I know that her hope for his return remains. It’s now been a year and 15 days since Ted’s life was ended. Eleanor has lived for exactly as many days without her father as she got to live with him. Today is her 25-month birthday. She has not forgotten him, nor did she quickly bounce back. For the majority of this past year, she couldn’t see my phone or computer without desperately clamoring to see pictures of him – calling for him. 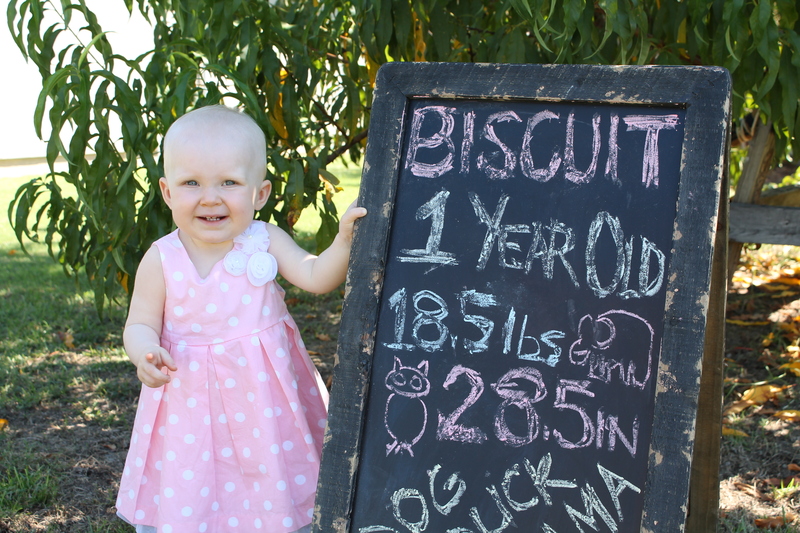 When she began to have tantrums around 18 months, they’d last for 30 and 45 minutes. I’d follow the recommendations my parenting books gave: distract, ignore, hug and quietly sing to her. When nothing would work, we’d sit down and look at pictures of him and she’d relax into my arms. She can now look at pictures without getting upset and she seems happy see the two of them together. She laughs at his silliness and brings up things from the videos, sometimes asking me to do a game that I had captured him doing with her (like when he’d fly her around the house singing To Fly Fly My Daddy and I to the tune of “Too Shy Shy Hush Hush Eye to Eye.” That man loved his 80s music). She talks about him every day and frequently says she dreamt about him when she wakes. Perhaps this is an answered prayer as I’ve asked God to allow her to see him in her dreams every night since our first night without him. She points out things that were his, mostly remembering they’re his because I’ve told her – like his gardening gloves that I now wear in the garden. But a few weeks ago, I slept in one of his t-shirts, one that I hadn’t worn since he had passed and not one that’s in any of the pictures. When I walked into her nursery to get her, she pointed at it and said, “daddy’s shirt” with a smile. Like many things, I don’t know how she would have known that. I remember the day she said “daddy” for the first time and the bittersweet feeling that came with it. While it was precious to hear her say that, it was another marker in our journey without him. He was daga to her when he was still living, but he’s become daddy, and a man she largely knows only through pictures. One day I came home from an errand and Ted was sitting on the couch with Eleanor in front of him at the coffee table and a big bowl of watermelon in front of her. They were watching the BBC’s Big Cat Diaries and he was feeding her watermelon chunks. She didn’t even notice my walking in (or the red juice dribbling down her chin) because she was so entranced by the cheetahs and lions. We hadn’t really let her watch much TV up to that point (except for the Women’s World Cup matches – duh), but I couldn’t help to be tickled when I saw how much she was enjoying not only Ted’s new favorite show, but also his new favorite food. Once Eleanor was born, Ted became super motivated at the gym and that translated into what he ate. We were both cursed blessed with an ardent appreciation for sweets, so we both had to have something sweet after a meal. But now we were trying to find healthier ways to satisfy the beast. I just upped the percentage of my dark chocolate (it’s hard to want a whole bar when it’s 85% cocoa – yawn) and he began eating watermelon for his dessert. A half pint…every day. What I got in flavonoids from my chocolate, he got in spades in lycopene. Hello heart healthy. 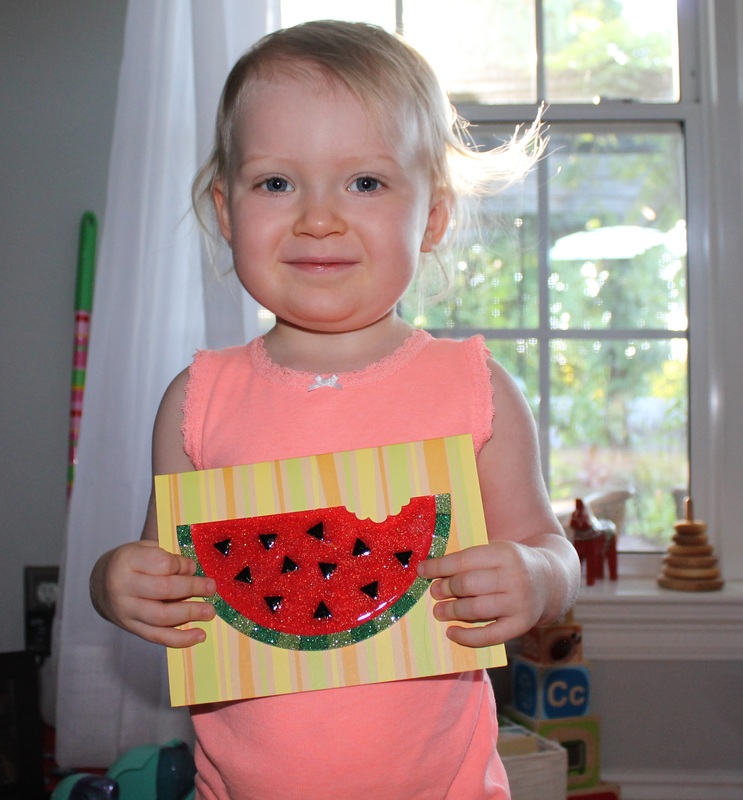 Eleanor was already beginning to show a pretty decent affinity for watermelon by that point, but in the months that followed, she became obsessed. About six months ago, a friend of mine was watching Eleanor so I could paint the town red (by grocery shopping) and she told me that after eating a full dinner, Eleanor plowed through the half pint of watermelon, then proceeded to drink the juice. So I decided for her 2nd birthday, we’d do a watermelon theme. That summertime goodness had not only become her favorite thing ever, but more importantly it was a nod to Ted. It made me feel like he was part of the day. We had an old-fashioned birthday party. 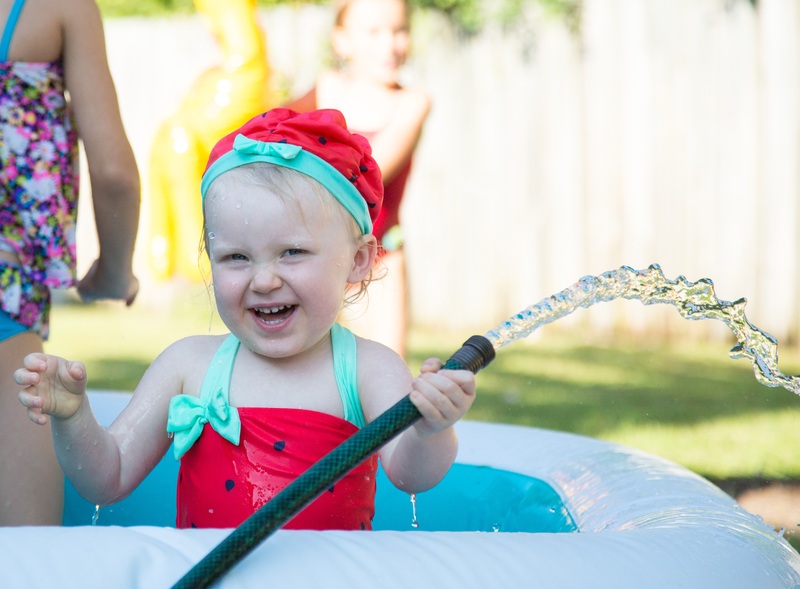 Friends helped me put out some inflatable pools and slip and slides in the back yard; I’ve never seen Eleanor have so much fun. Her best friend had a watermelon swimsuit and I was able to procure a matching swim cap. She was an absolute doll. It warmed my heart to see her so incredibly joyful, but as with all sweet moments, the sweetness rests like a thin blanket over the cold sadness that is our loss. 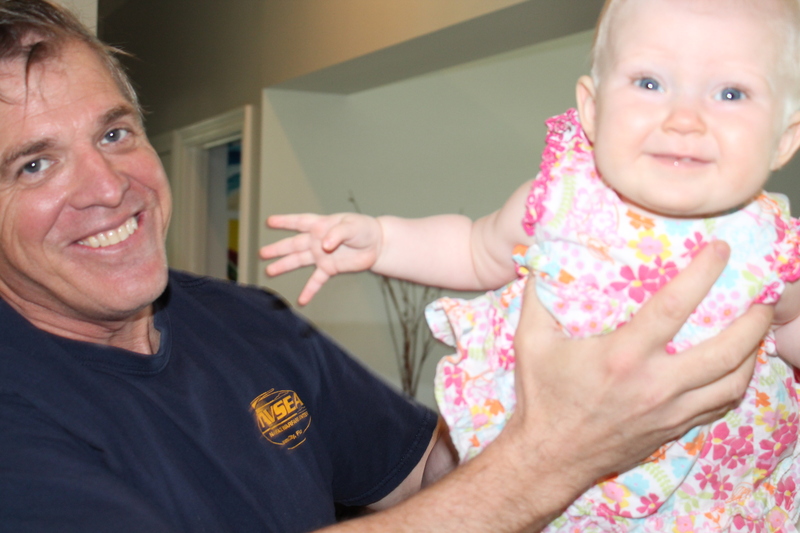 It was her first birthday without him and his absence was gravely noted. Underneath all the laughs of the children and the smiles from the adults watching them, he was incredibly missed, by everyone. Ted would have loved to see her turn two. He would have loved witnessing her joy and adding to it with his own. And like all little girls, she would have loved to make her daddy proud while the spotlight was on her. I wrote her a birthday card from him, something I do for each special occasion because that’s what he did (even Christmas and Thanksgiving). As with other cards I’ve written, I told her what I think he would have said if he were able. I told her how proud he was of the loving, brave, and happy little toddler she was growing into. I told her he saw himself in her when she showed such determination in figuring out how something works (he always marveled at her grit). I made sure she knew how much he would have loved to be a part of her big day but that he was watching her from Heaven, with the biggest of smiles. As I wrote this the night before her birthday after I had put her to bed and the house was quiet, I heard an owl hooting outside. Over the years, Ted would point out a horned owl that would return each year to its perch in our neighbor’s pine tree. A few weeks before the accident, we were walking Eleanor after dinner and saw him on the bare branch at the very top of the tree and Ted excitedly pointed him out to Eleanor. Ted liked owls and he began a tradition with her that summer when he’d come home from work. He’d take her out to the raspberry vine “to say hello to the hootie,” which was a fake owl perched at the top of the trellis to ward off birds from his precious berries. Eleanor loved to touch it and she really loved that Ted would let her pick one or two raspberries and eat them right off the vine. When she’d of course want more, he’d tell her they had to save some for the next day. He loved that she liked owls and even incorporated that into the invitations for her first birthday. I don’t know many men who design their child’s birthday invites, but he did – and was super excited about them when we picked them up from the printers. Fueling her interest in owls, Ted would take her to the toy bin in Target and let her pick out a stuffed owl for her to hold during their shopping trip. At the end of each trip, he’d take her back to the bin and have her put it back so she could hold it the next time they were there. He thought it was so sweet that she never fussed when she’d have to relinquish the toy. I was so charmed when he told me this story, so after he passed, a dear friend of ours went to Target and bought both stuffed owls that she found in hopes that one of them was the same one that Ted would get for Eleanor. For the last few months, Eleanor and I have heard owls constantly. 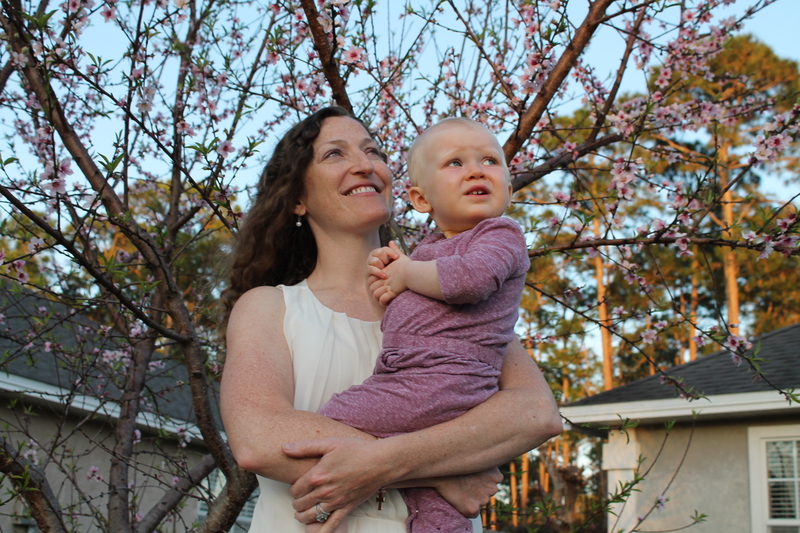 We frequently hear our tree-top owl when I open her window in the morning or playing in her baby pool in the back yard, but we also hear hooting at my mom’s, at the navy base when we go the playground, and out running errands. They seem to be a part of our days and we both get excited when we hear one. One evening shortly before her birthday, we were sitting on the porch to listen to the owl. Eleanor was freshly bathed in her PJs, snuggling in my lap as we watched him silhouetted against the sky. Suddenly, he left his branch and swooped down almost to the ground about 10 feet in front of us, then flew back up and over the house and out of sight. I’ve never seen an owl do that – I felt like it was him, Ted, saying hello. 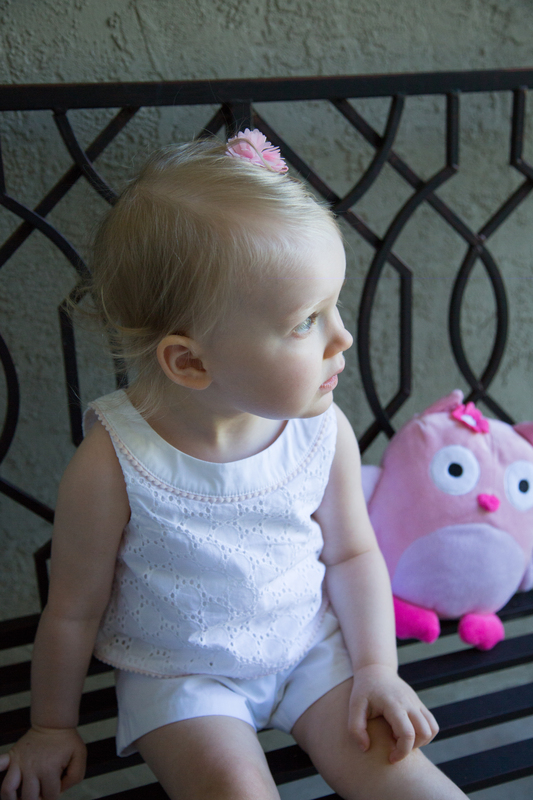 I’ve told Eleanor the story about her daddy taking her to see the hootie at the raspberry vine many times and that maybe daddy sent the tree-top owl to watch over her. My intent isn’t to confuse her, but rather to give her comfort. And honestly, it gives me comfort as well. When I heard the owl’s faithful hooting as I wrote my sweet baby girl a birthday card from her daddy, with my heart breaking that he wasn’t alive to do so, I felt – I believed – that was Ted was watching over me too. Often times it’s the endings that make us think back on the beginnings. In the months that have followed Ted’s death, the memories that fill my mind most are the ones from the beginning of our relationship. That thrilling time when our hearts were bursting with anticipation of when we’d get to see each other again and joy when that moment came. We fell in love so quickly, so deeply. I remember his first day with our company and overhearing him when he was being taken on a tour of the office. When he was being shown the supply closet he said, “Neat, is this where you store all the Mont Blancs?” It was evident the other person didn’t get the reference to the luxury fountain pens that have been around since the turn of the century and cost hundreds (even on Amazon), but I thought the joke was adorable. I remember a few weeks later being in large conference and noticing him join in on one of the sessions. I saw him fervently scribbling notes and then realizing he was a lefty. I was bemused as I too am a lefty and an obsessive note taker. I’d like to think it’s the journalist in me, but really it’s so I don’t take too many mental vacations. He caught me looking at him and flashed me a grin that I could see from 20 feet away (despite the fact that the overhead lights were out so as not to compete with the projector at the front of the room). But we had actually met a few years before he started with our company when I was living overseas and he had just moved to Panama City to begin his final tour in the Navy. I had been politely asked by the Italian government to leave the country after teaching English to their children without a work permit. Whoops. So I was home for the summer and working at the Public Affairs Office on the navy base. Around lunchtime, someone came into the office saying that a plane had landed on the highway just outside the fence. It turned out that it was right at the stretch of road that our parking lot bordered so we all walked to the fence to check it out. It was a banner plane, not an uncommon sight in the height of summer when local restaurants feel compelled to wow the tourists with the great array of domestic beers they have on special (this was before Panama City joined the rest of the country in appreciating microbrews and imports). The plane began experiencing engine trouble on its way back from picking up a new banner and the deft pilot navigated between the power lines, under the stop light, and around traffic – all to land on the 4-lane highway that runs beside the base. I had walked down the fence line a little so I could get a better view when this (devastatingly handsome) guy came up. I don’t remember what he said but I remember it made me laugh. We bantered a little and then he introduced himself with a smile that one doesn’t forget. We chatted a bit longer and then went on our way. The next day, I was waiting for my dad to pick me up for lunch (he too worked on base) when a car pulled up. I couldn’t make out the driver initially but I could see the smile distinctly. When he rolled down the window, I saw it was the guy from the fence. He asked, “Is this what you do, stand on the sidewalk and wait for someone to offer to take you to lunch?” My heart leapt and I tried to think of a witty response (think, think, think, think, think). But sadly, my dad drove up right at that moment. I wanted desperately to talk to this guy, about anything, but all I could manage was a laugh and the explanation that I was waiting for my dad, who was now waiting for me. He said something charmingly funny and we said goodbye. I didn’t see him again that summer. I went back to Sicily the next month and returned to my old life and responsibilities back there. Though I thought I’d never see him again, he remained in the back of my mind and I hoped that somehow our paths would cross. Time passed and I eventually moved home to Panama City and began working. A year later, he came to work for the same company and on his second day I ran into him in the break room. 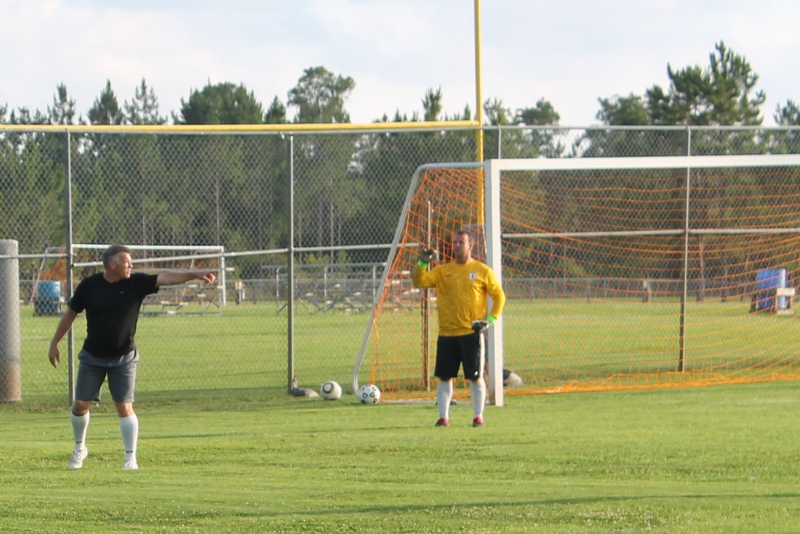 Clearly not thought out, I blurted, “You’re the guy from the fence.” He was understandably perplexed, so I described the banner plane landing and then it clicked with him who I was. The guy at the fence was Ted and that fateful day was 10 years ago today. I didn’t know it then, but that meet cute would forever change the trajectory of my life. I remember when I learned that Ted’s birthday was exactly a month before mine. This was back before I knew if my affections were requited, but I was scoping him out in the employee handbook where birthdays were listed. I was delighted when I saw the date and I devised a way to use the fact that he was born on Flag Day, and I on Bastille Day (two obscure holidays that most people don’t think about in the US) as a lead-in next time I bumped into him in the break room. Luckily, he thought it was cool (and I thought it was a sign that we should be together – clearly) so fast forward to after we began dating and our summer birthdays were something we made the most of. Ted always went above and beyond to make things special. He put more meaning into gifts than anyone I’ve ever known. The most exciting gift I’ve ever gotten (even more than my 7th Christmas when I got my very own bike) was the surfboard Ted gave me after we began surfing together. That board has hundreds of hours logged on it by both of us, and we dreamed of passing it down to our baby girl when she got big enough. The year we got married, Ted brought me coffee in bed and on the tray was an envelope. He had arranged for Eleanor Beardsley, the NPR correspondent based out of Paris who I would very much like to be one day (listen, I’m a Francophile and love talking to strangers, this would be a dream job), to send me a postcard from Paris on my birthday. This was during the Arab Spring and she was covering the Tunisian Revolution, so she sent one from there instead. Now, I imagine Ms. Beardsley to be an impossibly busy person given the state of affairs in the Middle East. Yet Ted was able to appeal to her as a “newlywed trying to do something special for his wife’s birthday.” He also charmed her into reading my (fledgling) surf blog, which she commented on in her postcard – a compliment whose wings I floated on for the rest of the day – and sending a picture of herself. So this very busy foreign correspondent, who’s never met me or my dear husband, had someone take a picture of her on Pont des Arts, so she could enclose it in her envelope to me on my birthday. Pont des Arts is a pedestrian bridge in Paris made famous by hundreds of thousands of love birds who put a lock on its fencing as a symbolic gesture of their amour. The city put a stop to this sweet but detrimental practice in 2015 when the weight of the locks began compromising the structural integrity of the bridge. Therefore, both Ms. Beardsley’s picture and the historically significant post card serve as a time capsule in addition to a charmingly thoughtful birthday gift. That man knew no bounds when it came to making something special. He loved grand gestures and he never shied away from recruiting others to help in his endeavors. By far the most meaningful gift was for my first birthday after we met. He gave me novel by a woman who was born at the turn of the century in France. When she met the love of her life in 1947, she was Ted’s age when he met me. Moreover, the man who became her husband was my age when I met Ted. This man was utterly devoted and loving to her until her death in the 70s, after which, he became her literary executor. Ted found a copy of one of her published diaries that had the hand-written inscription, “Finally, the real story – the missing piece, the passionate woman,” on the cover page by none other than her husband. Somehow, Ted found this copy and presented me with it, on my birthday. He saw a parallelism between their love for one another and ours. I remember where I was when I opened this gift. I remember how touched I was by his gesture and the incredible effort he went to in making it. It’s been years since I read the printout giving the history of this couple that Ted included with the book, so I just read it again. In doing so, I saw that they were married on March 17, 1955, St. Patrick’s Day, just as Ted and I were 62 years later. The symbolism that struck me from before our relationship even began, wove through our courtship and marriage, and continues through to today. Though our time together was far too short, I ardently believe we were meant to be. I walked into the water, feeling shells crunching under my feet. It was cooler than I expected but by the time it was up to my waist, I was used to it. 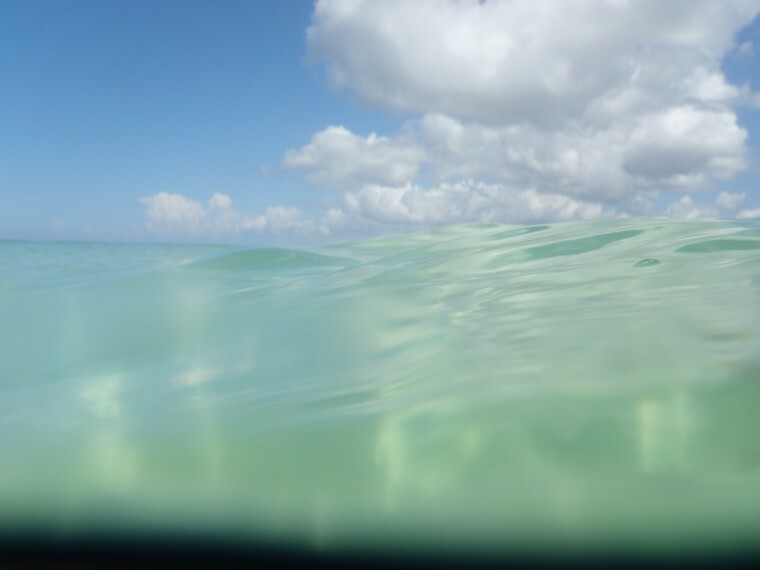 When I got outside of where the waves were breaking at the first sandbar, the sounds of the people on the shore had disappeared into the low roar of the waves. When I was chest deep, I took a breath and submerged myself. I stretched out on my back and looked up to the surface. No voices of others, no internal chattering of my own. Just the muffled sound of the waves above me. 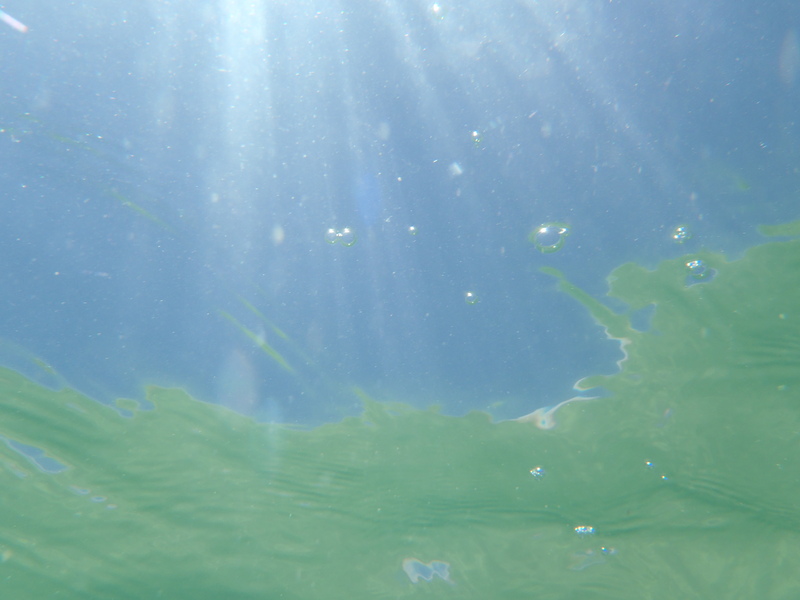 The water so clear and the sky beyond that was so blue. It wasn’t as I had pictured it for so many months. Since the accident, I’ve envisioned myself floating in turbulent waters, looking up at a darkened, ominous sky, and then sinking down to the bottom, so very far from the surface. But not today. Today is his birthday. I wanted to feel close to him, so I came to the spot where we spent countless hours together. It was the place where I caught my first wave, where he pushed me into thousands of waves after that, where we’d sit together on our boards catching up on each other’s days while we looked out to the horizon for the next ride, where we found ourselves in bigger surf than we were suited for more times than we could count, and where we’d catch our last wave of the day – which would be one we’d catch one together. He called those “love waves,” and it was his rule that we had to catch a wave together before we could go in…and we had to kiss afterwards. He also had a rule that we had to kiss when the sun set into the water during our evening surf sessions. He was such a romantic. This was the first time I had been back to this spot, or even in the water, since losing him. I felt like I was walking in slow motion when I was coming up the boardwalk over the dunes until the Gulf of Mexico stretched out before me. The place that once represented such joy and playfulness, has become a peaceful, quiet place to honor him, and honor his love of the water. He delighted in being on the water in any capacity, but the way he’d get so excited the night before going fishing was unparalleled to any other time. No matter how long of a day he had, there’d be a spring in his step while he was getting our gear ready. He told me he was the same way when he was little and would be going fishing with his “Pop Pop” the next morning. He’d be so keyed up that he couldn’t go to sleep so his grandmother would bring him a concoction of milk and sugar that was supposed to be a magical potion to help him fall asleep. He’d diligently drink it down and he said it worked like a charm. Here’s to the placebo effect. When we started surfing together, I found myself feeling the same eagerness for the morning to come. If we were going for an early session before work, I’d get everything ready the night before. In the years before we got married, we’d meet at his house and drive down to the beach. He’d always have a thermos of coffee waiting for me. There was one autumn that I was really into the Green Mountain blueberry coffee and every time I smell it, it brings me back to those mornings, sitting beside him in his silver Fj in my bathing suit and sweatshirt. This morning’s trip to the beach was somber. We weren’t listening to the surf playlist that he made. We weren’t chatting about the day’s plans or goings on in the world. 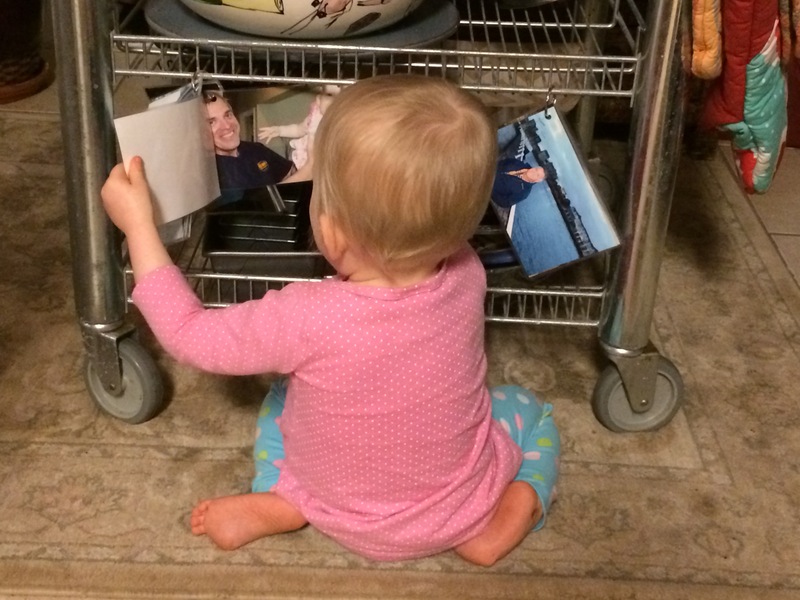 I was quietly alone with my thoughts – a rare opportunity in my life with a toddler. When I was walking down to the water’s edge, an MH-60 (the next generation of the helicopter he flew) rumbled over and I felt Ted’s presence. After I sank into the water, I started swimming. Within a few minutes, I was paralleling beach that was void of any tourists. I felt like I had the water to myself and that seclusion gave me comfort. For once, I didn’t feel like others were looking at me as “the widow,” but rather, I was just a woman, swimming. I thought about him. I thought about us, our plans, our dreams. When I got tired of swimming, I walked in the water. I talked to Ted, I prayed to God. I cried. My tears mixed with the gulf and I let the salt water wash over me in hopes that it would cleanse my mournful soul. I hoped it would provide me with a brief respite of peace and a sense of him. 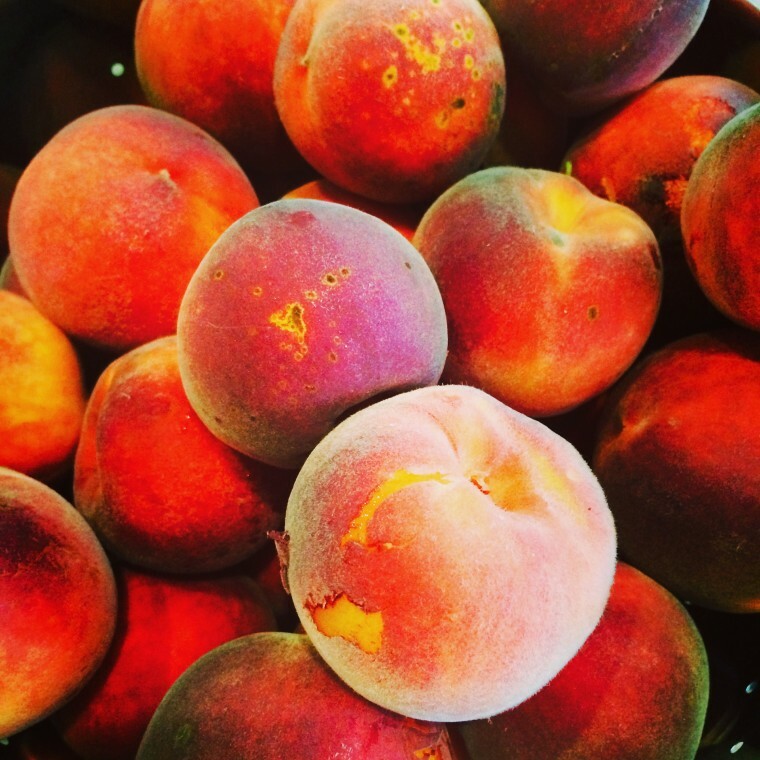 The first summer we were together, there were peach stands on every corner. I had never seen so many local farmers setting up tents to sell their crops, and I haven’t seen anything like it since. 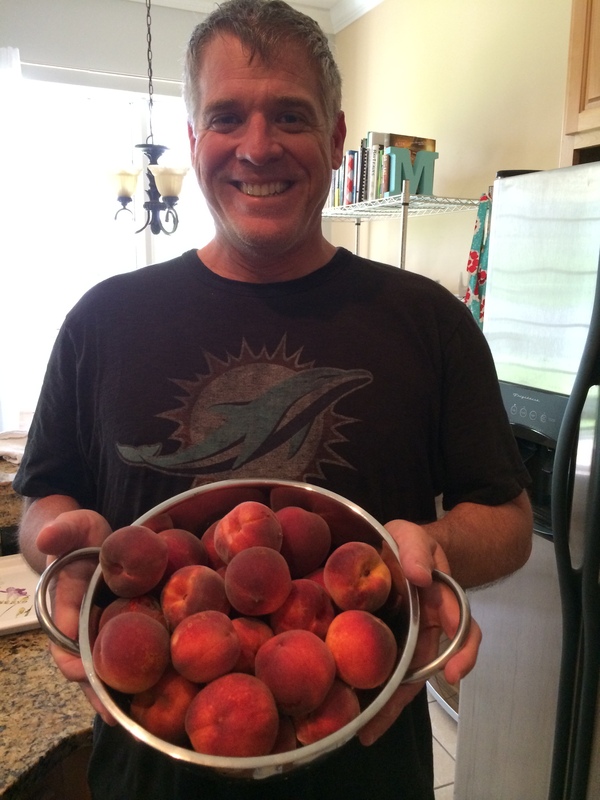 Ted and I were constantly buying small baskets of peaches and bringing them to one another at the office. I have memories of him sitting in my cube eating peaches so ripe that he’d invariably get juice on his gorgeous ties. I felt like we were kids, for that brief moment in our hectic work days, sneaking up into a shade tree eating something we snuck from our mother’s kitchen. 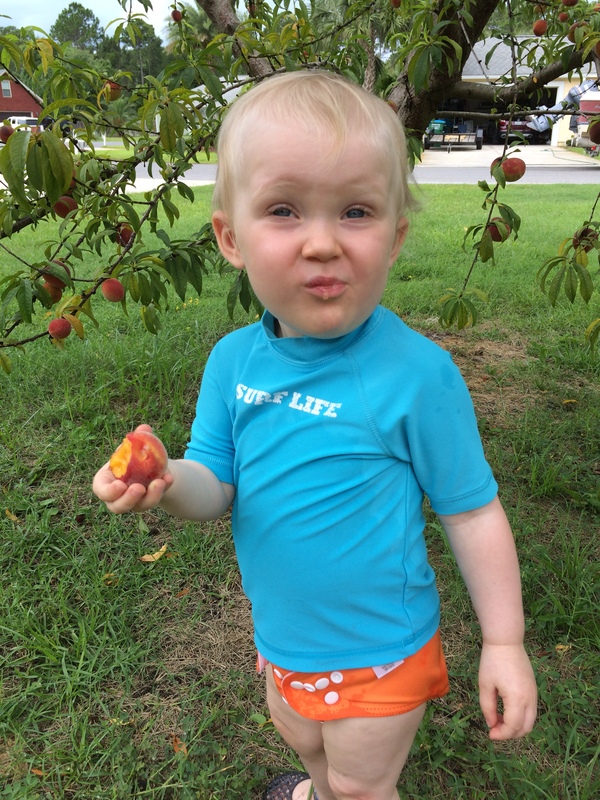 A couple of summers later, we were coming back from surfing one morning when we saw a farmer who was selling homemade peach ice cream from a roadside stand. In typical Ted and Maureen fashion, we hit up that farmer every time we passed by for the rest of his short season. 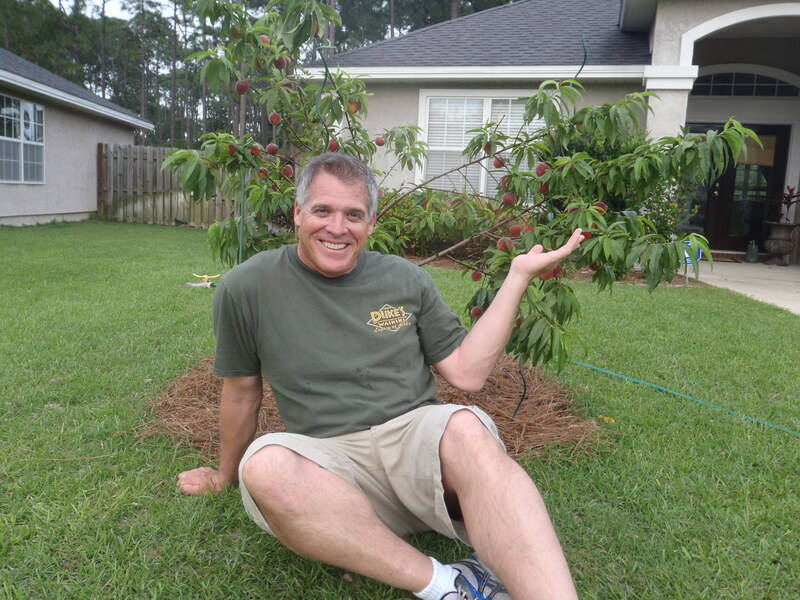 After we got married, I only thought it appropriate to give Ted a peach tree for his birthday. 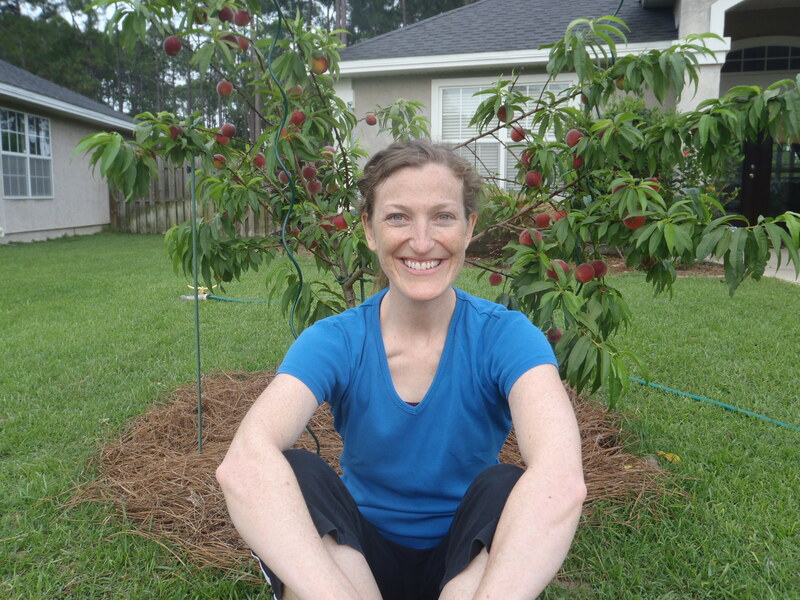 I had given him a grapefruit tree for our first dating anniversary and a fig tree a year or two after that, but peaches were becoming a thread that ran through our relationship. Ted babied that tree like no other in his little grove. He built a platform on wheels so he could bring it into the garage on cold nights that first winter while it was still in a pot. After we planted it the next summer, we ventured out on cold January nights to cover it with blankets to protect it from the forecasted frost. 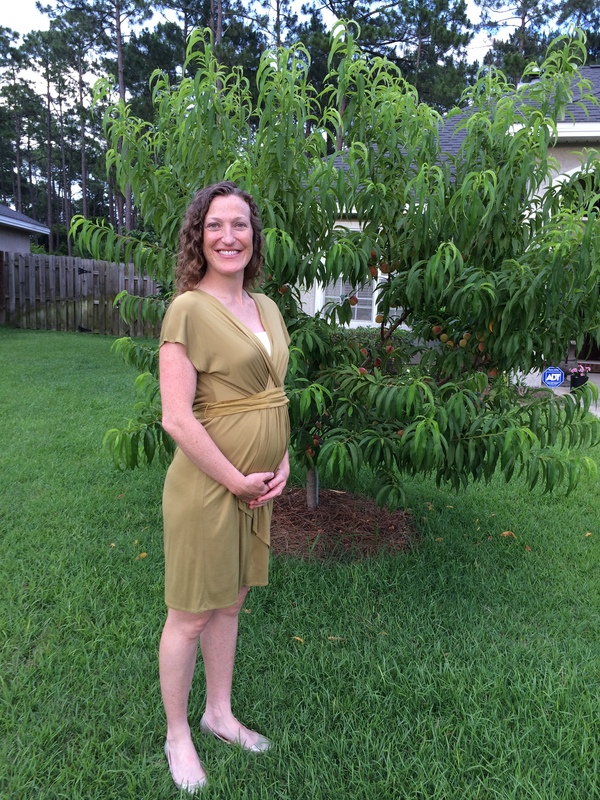 When I got pregnant, we decided we’d take a picture of me in front of the tree with the baby in my belly, and then each year we’d take a picture with Eleanor in front of it as a sweet way to chart her growth. 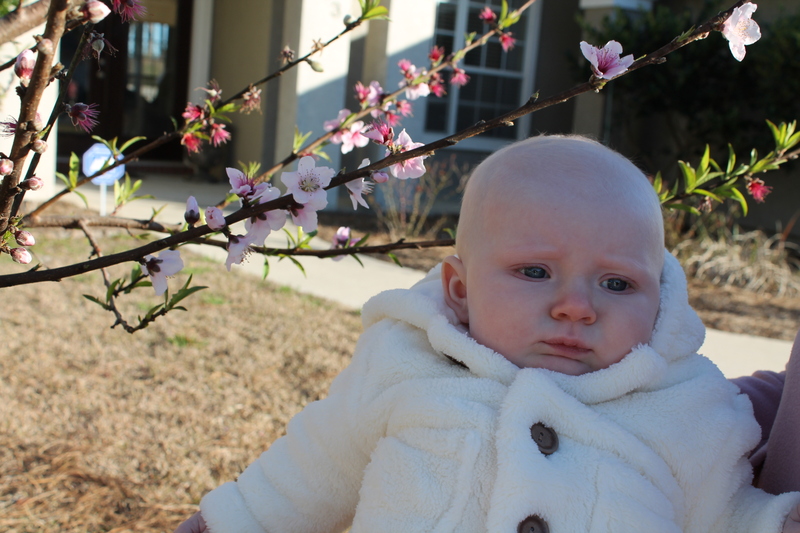 We loved looking out our window and seeing the pink blossoms in the late winter. 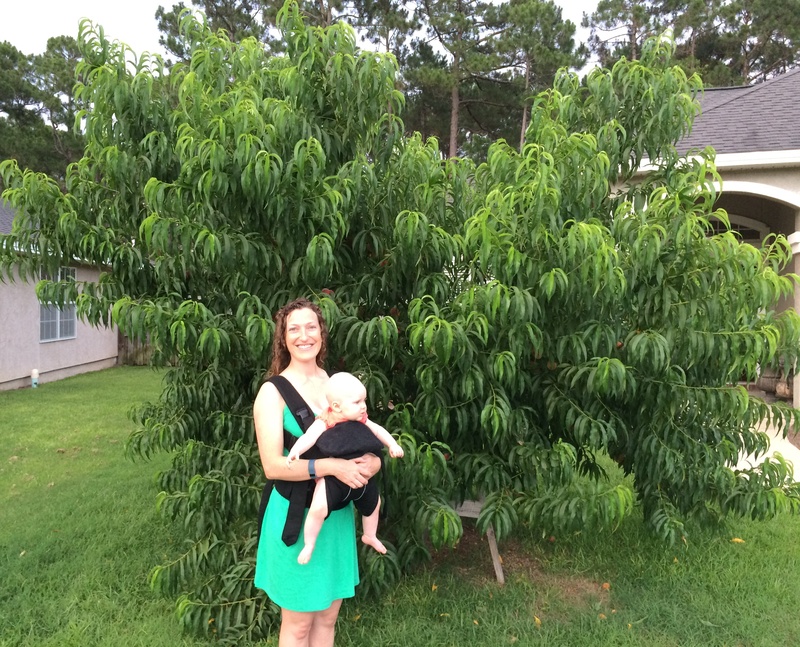 Our neighbors would ask if it was a cherry tree because it looked right out of the Tidal Basin. 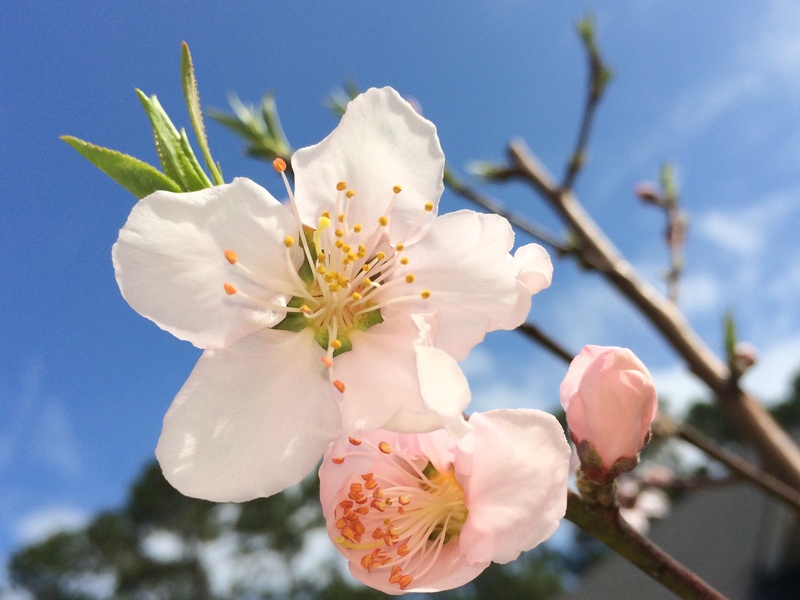 When those delicate pink flowers gave way to fuzzy baby peaches each spring, Ted meticulously culled through them to make sure there weren’t more on a particular limb than the limb could support. Last summer, one of the limbs did in fact have more fruit than it could bear, and it broke under the weight. So Ted created a cast using burlap and rope, then he propped it on a sawhorse until the harvest was over. He loved his trees and his garden, he loved caring for things. We had quite the bumper crop last summer and despite giving bags to our friends and neighbors, we still had enough for cobbler and pie. 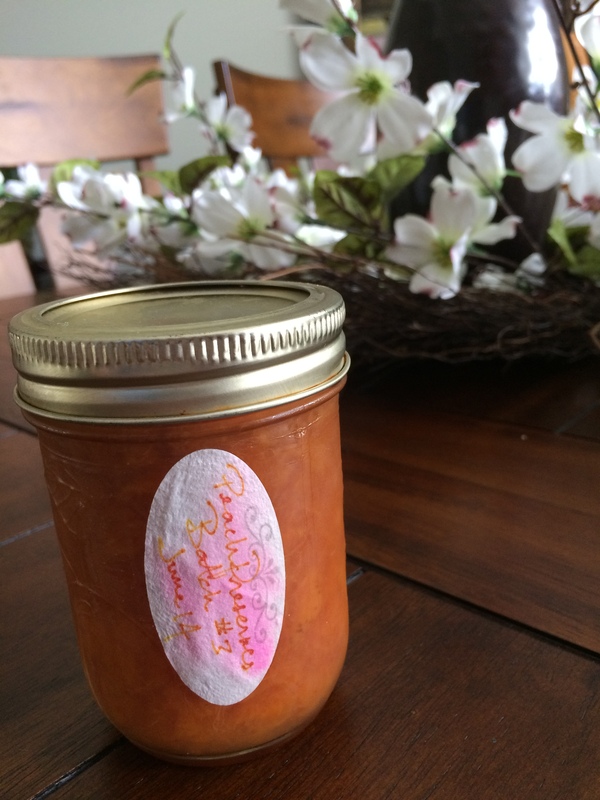 With the remaining peaches, we made a huge batch of preserves and gave the amber-colored treasure as gifts to our family. Ted took the lead on that project and I was his sou chef. He had become super dedicated to his morning workouts and didn’t want to sabotage his efforts with a gallon of sugar in the pot of peaches, so he found coconut crystals to use as the sweetener. Since sugar is the preserving ingredient in preserves, we weren’t sure how long they’d keep, but I opened up one of the last two jars on our wedding anniversary in March and it was delicious. For lunch that day, I made Eleanor and myself eggs from our neighbors chickens, grapefruit from our tree, and toast with his peach preserves. It only took my telling Eleanor once that the preserves and grapefruit were daddy’s, so now every time she sees either, she says dada with a big smile. One jar remains and I hope it’ll last long enough for Eleanor to be able to try them when she’s older and can savor the experience. I presume that will be terribly significant to her at a certain age – being able to eat something made by the man she craves to know more about with each passing season. 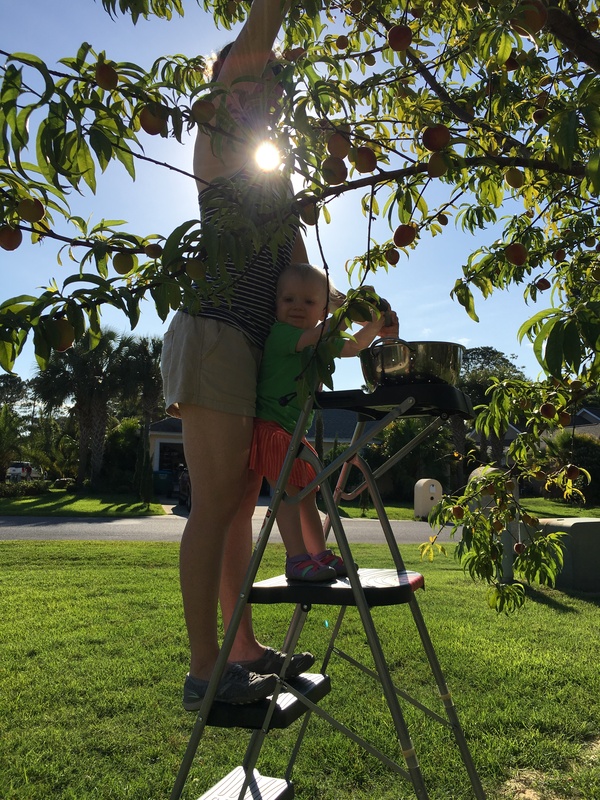 Now that this year’s crop is ripening on the tree, it’s almost a daily ritual to harvest peaches when the sun gets low in the sky. 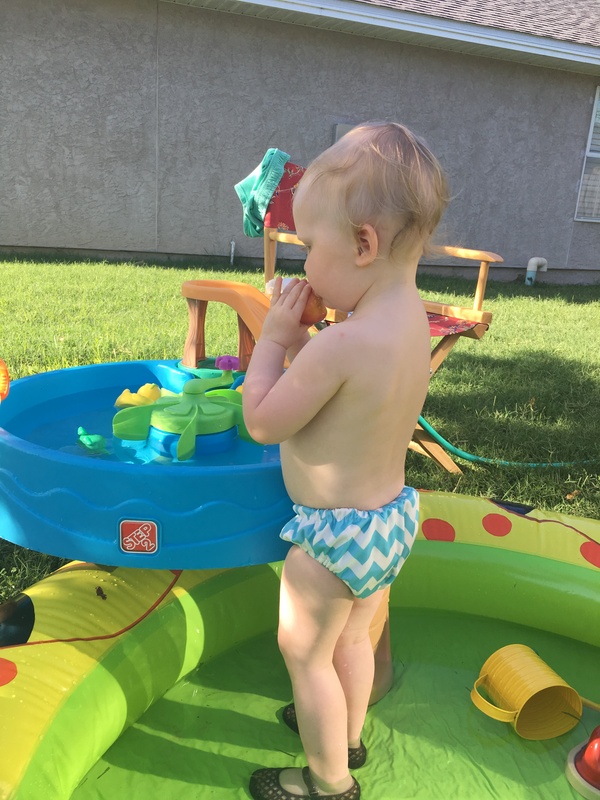 If friends or family are over, we’ll set up her baby pool and water table, which she loves dipping her peaches into between each bite. But the ever-growing helper, she likes picking them off the tree too. 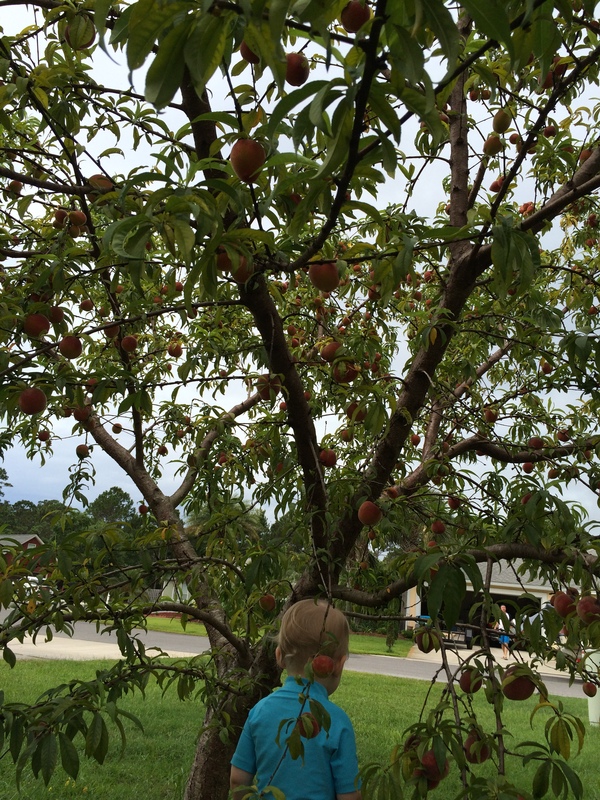 Neighbors stop by to admire the tree and we send them home with paper bags filled with peaches. Everyone marvels at how much it produces and how quickly it’s grown in the few years since we planted it. It’s becoming a gathering place for our family and neighborhood, which would have made Ted proud. Eleanor knows it’s his tree; she points to it saying dada. She seems drawn to it – almost like she senses his presence. On the way to work today, two ambulances passed me. This was right in the area of Ted’s accident and during the same time of day. Immediately, images of Ted lying on the gurney flashed through my mind. I tried to block it, as I so frequently have to do, but I couldn’t help but to picture him that day, six months ago, when the ambulance rushed him to the hospital in a vain attempt to save his life. I saw him in the new shirt and pants he was wearing that day, which he got the weekend before when he took Eleanor on a “field trip” to Dillard’s. When he got home from the store that day, he told me to close my eyes while he held something behind his back. As I opened them, I saw him grinning, holding a beautiful high-neck black dress that he said Eleanor “thought would look really nice on mommy and accentuate her neck.” He said I didn’t have to try it on right away but I could if I wanted to (hint, hint). That was one of his countless endearing qualities – he loved making people smile, and he got excited about it. The dress fit perfectly and we decided that I’d wear it to the company Christmas party in a few months. We loved those parties as it was a rare opportunity for us to dance (and we oh-so loved dancing), so we already began planning who we’d ask to babysit. As it turned out, I wore the dress 10 days later at his funeral. All of this ran through my mind in the remaining half mile to the office. By the time I pulled into the parking lot, my heart felt like barb wires of emotions were choking it: the horror of picturing my husband in the back of an ambulance, the sweet sadness of his last thoughtful gesture, and the crushing disappointment of yet another plan that would never come to fruition. When I walked into the office, I was greeted with smiles and hopeful faces. This is how it always is. They hope I’m doing better, they hope I’m okay. They ask how Eleanor is and I beam as any parent in love with her baby would, and tell them how sweet her little spirit is. I tell them something funny she’s done recently so we can laugh and pretend that I’m just another mom sharing stories about her kid. Inside I’m trying to push down all the feelings that waved over me in the 60 seconds before I walked in the door. I’m trying to be the Maureen they all know. The one who’s easy to laugh (too loud probably) and makes jokes – usually about herself. The one who maybe asks too many questions (because she just likes people), and gets emotionally invested in other’s lives – despite the fact that she’s been told she can’t save the world. Some of these traits come out to play when I’m leading orientations, which I absolutely love. This is for new employees company-wide, so people dial into my web conference from all over the country, and sometimes the world. I am fascinated by different places and recreation, so I abuse my position by getting people to talk about where they’re from and what they like to do for fun. The best orientations are when the orienteers get gabby themselves and begin connecting to one-another over the virtual chat box. Because I only work part time, and usually from home, when I do my orientations I use one of the collaboration rooms at the office. These are former private offices that have been turned into public spaces for people who need a common area but not a full conference room. It just so happens that the room I use is Ted’s old office. The office that when he was newer to the company, I’d pretend to stop in just so I could raid his candy dish, but in actuality so I could talk to him about whatever I could come up with. The office that, once we started dating, I’d swing by just to tell him I loved him or to see if he wanted to sneak a surf session in after work. 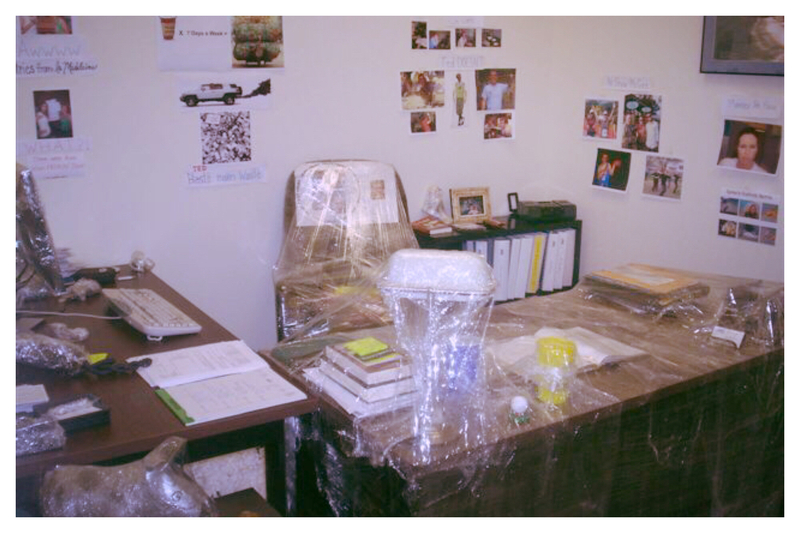 The office that we punked for his birthday by wrapping everything is saran wrap and replacing his keyboard with one that had grass growing up through the keys. What? He had also been at a fishing tournament in the Bahamas for a week so it needed to be punked. This office holds so many memories for me. But now his furniture is gone and the walls are no longer decorated with his pictures and plaques. The only thing that remains of him are the scuff marks on the wall under where his desk once was and where his feet would hit. He always joked about his big feet. So I sit, trying to block out the ambulance, and the images, and the bittersweet memories, and get ready for my new employees. They, after all, have their own set of concerns and my job is to make their first day a little less confusing, and (hopefully) a little more fun. And with that, my next orientation starts and I begin getting to know the orienteers. All the while I try to pretend – if even for an afternoon – that my life isn’t what it’s become and I’m old Maureen, making people laugh. Someone told me today that it’s time that I move on with my life. It was in response to the honest answer I gave when he asked how I was doing and evidently, it wasn’t the answer he wanted to hear. This came from someone who neither had the right to offer me unsolicited advice, nor the past experience to have any basis of understanding of what I’m going through. The level of pain, despair, and suffering that one endures through a circumstance like this is incomprehensible – until you experience it for yourself. Though this was one of the worst things someone’s imparted on me since Ted’s death, it’s far from the only detrimental statement. Minutes after the funeral, I was holding our baby and the flag that the honor guard presented to me with a look of sincerity and sorrow that I will never forget. Despite the murky sea of shock I was swimming in, I had the cognizance to realize I would never get over this; I would never be the same. But when I made that statement, almost to myself, it was met with one of the most common platitudes spoken to someone who has lost their spouse: he would want you to be happy. As though it’s my uncertainty of what Ted would have wanted that’s preventing my happiness. How about the fact that I’ve lost the love of my life? Or perhaps the fact that my innocent child is now fatherless? If not those, then the loss of the present that we worked so hard for and the future we dreamed of? Could those be reasons that I’m entrenched in a level of sorrow that’s not comparable to divorce, the loss of a friend, the loss of a grandparent, or even the loss of a parent for an adult child. Those are all horrible losses, undoubtedly, but they are not the same. Yet for some reason, so many are unable to resist drawing comparisons, telling me how I should handle this, and discounting my need to grieve. When I tell people I will never be as happy as I was six months ago, they give me a placating look that says aw, they all say that be they eventually find happiness. I feel like I’m screaming in a tank of water, and no one hears me. Yes, I recognize the fact that I may find happiness again (though, if this situation has shown us anything, it’s that there are absolutely no guarantees), but this loss is now the backdrop of my life, the lens through which I view my future. No matter what happens down the road, nothing can erase the fact that the life I dreamt of has been taken away from me and the family Eleanor was going to grow up in has been shattered. When someone says that God may have a great man in store for me, they may as well be telling me, you might find a really nice replacement husband for yourself and replacement father for Eleanor. Suggesting that a new man in our lives will fill the gaping hole that’s been torn into our hearts is as absurd as telling a mother who’s lost her child, you can have another one. People are simply not replaceable, so why say this? Is it a total lack of understanding, or are statements like this borne out of hope that if something as horrifying happens to them, it won’t be that bad? The only way to get through grief it is to experience it. You can’t shelve it, you can’t ignore it, you can’t rush it. If you want to come out to the other side as a healthy, fully functioning human being, you have to work through each stage, and it’s a long and all-encompassing process. It affects every aspect of your life: emotional (obviously), but also social, physical, mental, and spiritual, and there are no short cuts. People foolishly hope that I’m doing “a little better every day.” No one wants to believe that it’s actually going to get harder before it starts to get better. But the way our brain protects us from tragedies, especially sudden ones, is to buffer us with shock and denial. As we’re able to process the first little bit of the horror, our brain takes in a little bit more and begins working through that. With a loss as complicated and all-affecting as this, it could take a year before I have processed the entire loss. All the while, my anguish grows as my hope for the future diminishes. In one of the earlier sessions with my grief counselor, I revealed my devastation for Eleanor. How is this loss going to impact her? What is it going to feel like when she sees other children playing with their daddies and she has to accept the fact that she’ll never get to play with hers? My counselor urged me not to take on that part of the loss just yet. I had enough to carry and my overburdened heart wouldn’t bear much more. But so many people want to hurry this along. They see me exercising and getting back to work and want to assume I’m much better. They think that after the first year, things will be “back to normal,” but the reality is that I could be in the trenches for years to come. When I do get to the other side, things will never be the way they were, I will simply have a new normal – which will always be less than what it should have been. This morning, church was held at Fusion, the indoor sports complex our church bought years ago. 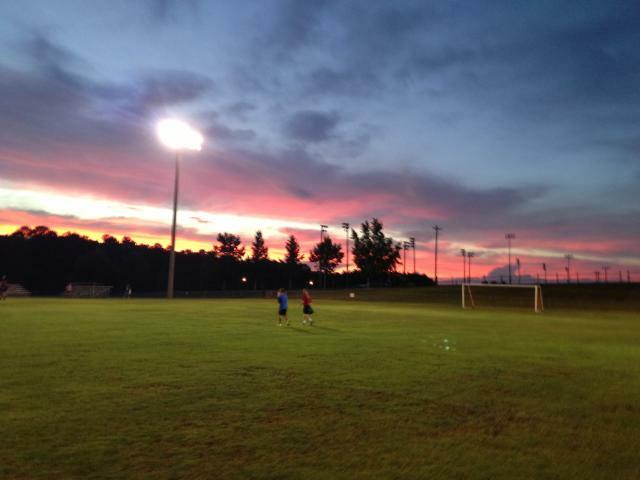 Last time I was there, it was for a soccer game when Ted and I played on an indoor team a few years ago. Walking in with my mom, the familiar smell of Fusion took me back to those games. It’s the smell of the ground up rubber they use on the turf to soften the blow when you fall. That smell is distinctive. 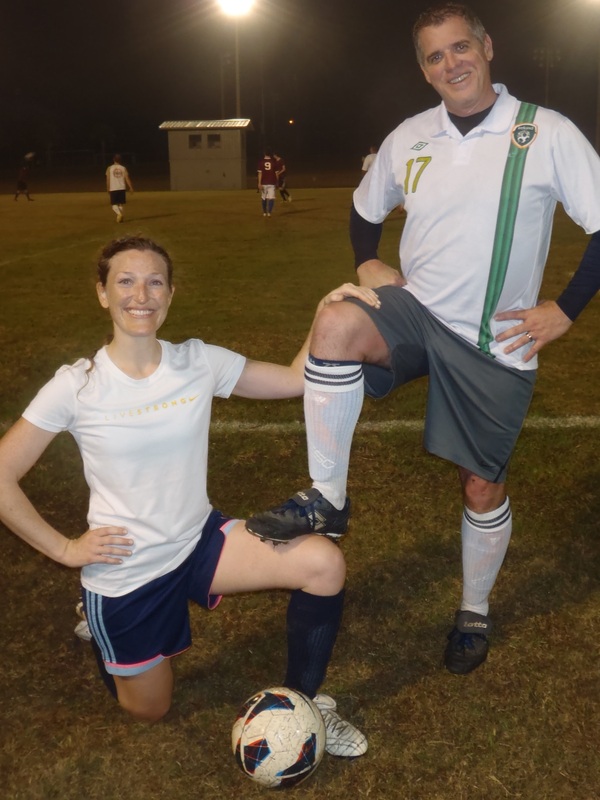 That smell always elicited nervous excitement and hopes that I’d play well, or at least not embarrass myself in front of my male teammates – most importantly Ted. The smell became associative, a trigger for those emotions. When I smelled it this morning, that feeling came back…but then was quickly overtaken by other ones when my conscious brain caught up with what my subconscious was interpreting through the memory of smell. New feelings of emptiness, heartache, anguish, what was and will never be again, flooded my heart. Ted and I started playing on a coed team the year we got married and played every season up until I was five months pregnant. At first, we were just happy to get on a team together, but after a few seasons, we took over our own team and we loved leading it together. Ted was the captain (duh) and I was the encourager. 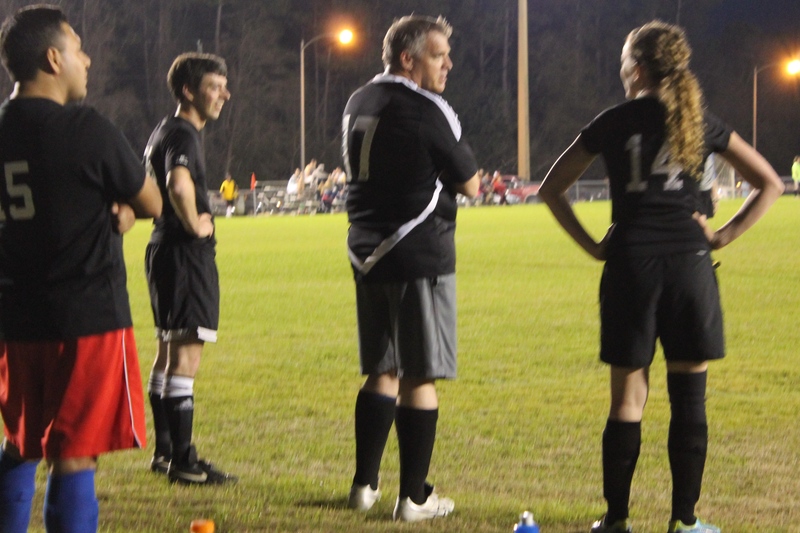 He was exceedingly competitive so when he’d coach (read: yell) from his command at center defense or goal, I’d compensate by cheering everyone on when I still had enough breath to cheer. As with all things, he was a great teacher, so I’d have him run drills with me in the backyard after work. More than once, we had to knock on our neighbor’s door to ask if we could open their gate and get our ball back. Ted would play with me until dark and sometimes we’d play by porch light if darkness set before we were ready to come in. For Easter, he bought me a practice net and little orange cones to dribble around – it was the best Easter present I’ve ever gotten. All of it reminded me of being a kid, only better. When I was a child, or even a teen, I didn’t care as much how I played, but as an adult, I did. 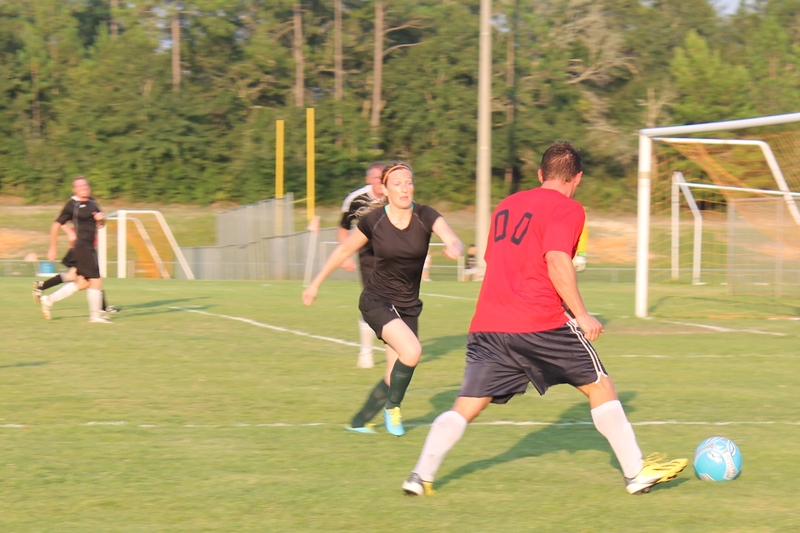 So I put effort into it and saw improvement – which only made us want to play more. 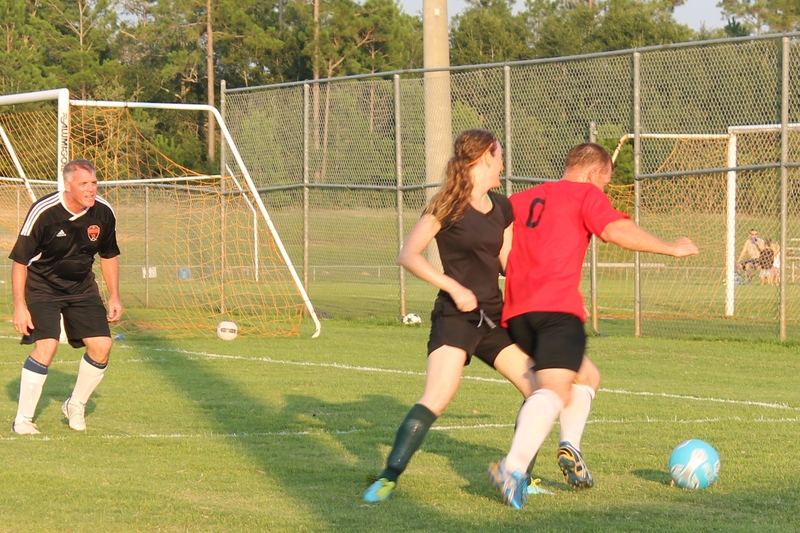 We’d talk about our defensive maneuvers on the drive into work and do shuttle runs in the gym until we felt nauseous. While I was a great encourager for our team, Ted was the best encourager for me. He called us the Irish Wall when we were on the defensive line together and I loved being on the field with him. What the 20-year-olds had on him with stamina and speed, he made up for it with smarts and teamwork. He was so good at pulling us all together, and he made it fun. We coordinated team practices, had our teammates over to watch the Olympics, and brought orange wedges to the games. The guys assumed that was all me and though Ted wanted me to go along with that, it was he who deserved the credit. He shopped for the oranges, washed and cut them, and packed them neatly into our Tupperware. At first it was kind of a joke as we all remembered the orange wedges from Saturday morning soccer games as kids, but then our teammates grew to look forward to them at the end of each game. No matter how hectic of a day he had a work, Ted never forgot the oranges, even if it meant running back to the store after he’d already come home from the office. On the way to a game one day, Ted busted out a clipboard he made with a backing that took dry erase markers. He had the whole lineup for that night’s game figured out and he was going to brief it during warm-ups. This was around the time that NBC ran the Ted Lasso campaign to promote their new coverage of the premier league and it was too good not to capitalize on. 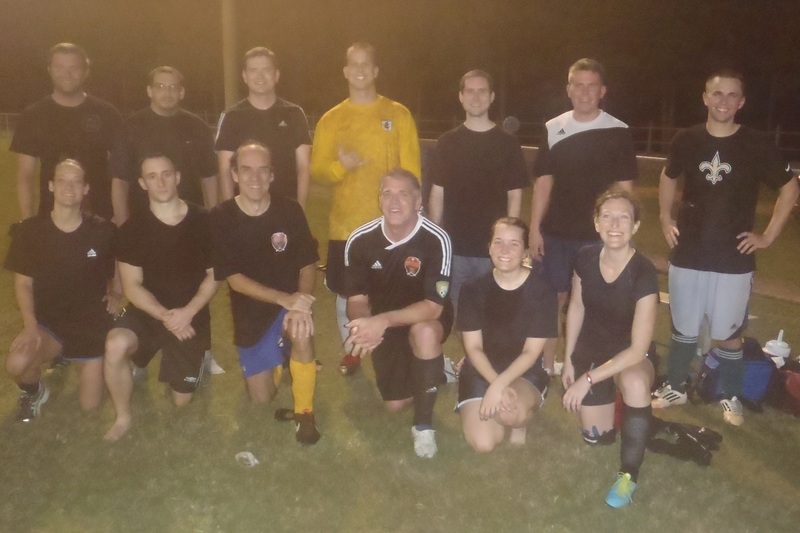 So we named our team the HotspurS (with an S, à la Ted Lasso). Ted made sure the team all watched it to get amped up before our first game that season. We lived for the World Cup, CONCACAF, the Olympics. When big games were going on during the work week, we’d end up meeting in the break room to snag a few minutes of the game before getting back to our desks. 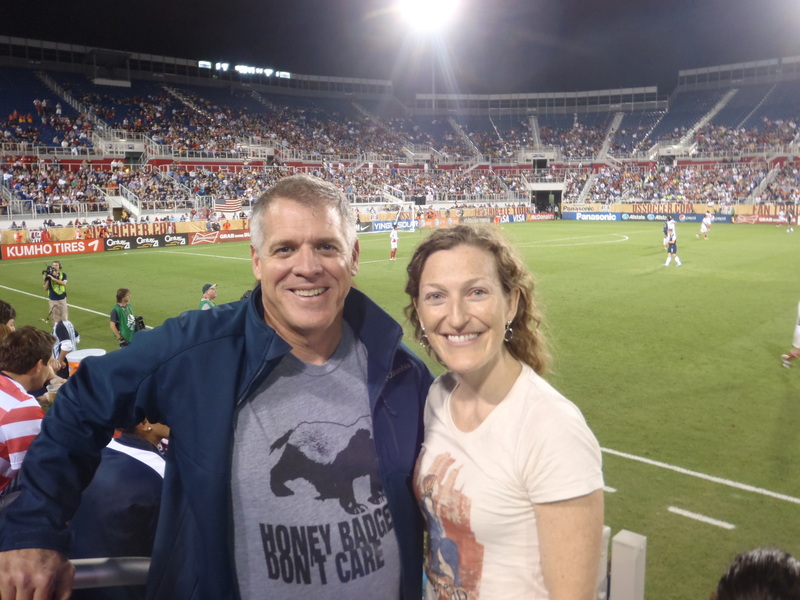 We flew down to Boca to see the Women’s National Team play a friendly against China in 2012 and stood amongst dozens of preteen girls who were scream/squealing in the stands after the game in a failed attempt to get one of the players to sign our program. When we went to Ireland for our first anniversary, we bought an Irish soccer jersey for a child we hadn’t even conceived yet. 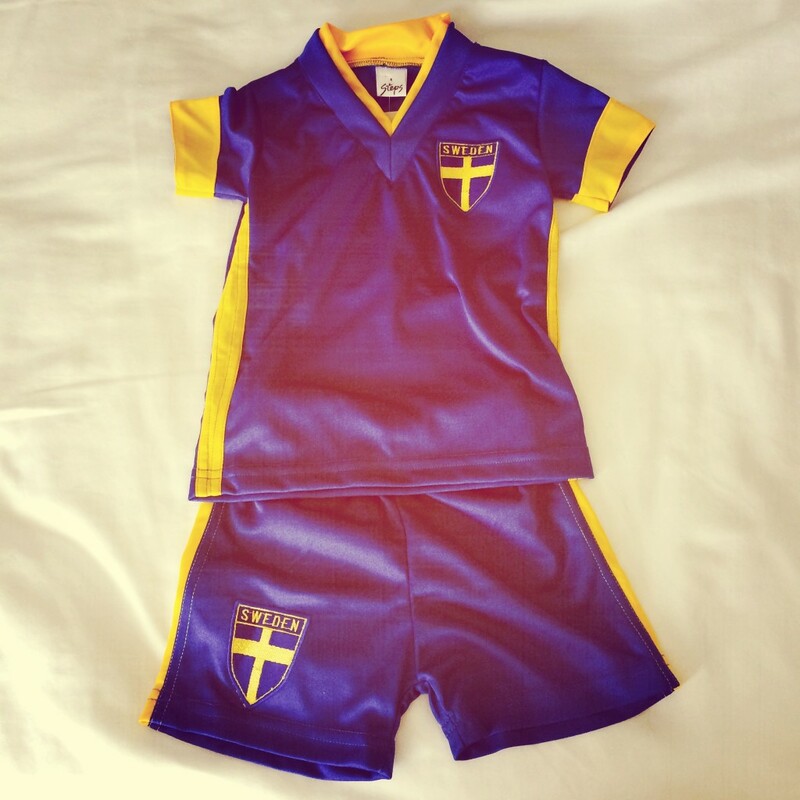 When we went to Sweden, we bought a Swedish soccer jersey for “the baby in the belly,” as Ted would say. When Eleanor was still in my belly, one of our dear friends gave us the smallest Clint Dempsey jersey she could find from the 2014 World Cup uniform. 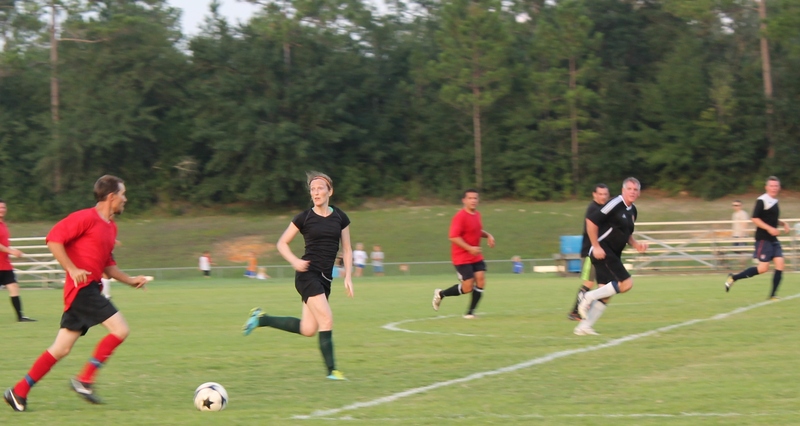 We knew our child was going to grow up on the soccer field – both playing and watching her parents play together. We took her to her first game (a local high school match) when she was 4 months old and had a hotel booked in Tallahassee to see the FSU women play Boston College on November 1. During one of our after dinner walks just before the accident, we talked about taking Eleanor the following year up to Montreal and see their professional men’s team play. And of course I was already looking up future Women’s World Cup venues – she’d be five when it reconvened in France in 2019. We planned to resume playing last fall and we would follow the construct of one of our former teammates and her husband: bring the baby to the games and hubby and wife sub out for each other, taking turns holding the baby. Eleanor would know her mommy and daddy weren’t just her parents, or just husband and wife, they were teammates – in every sense of the word. As our world seems to become an increasingly broken place, with the terrorist attacks in Paris, San Bernardino, Planned Parenthood clinics, the list goes on, I find myself thinking, hoping, this is it. Never one to subscribe to end of days rhetoric, I would now welcome it. My outlook has always been one of positivity and hope, always looking for the silver lining, but my light has gone out. Now I look at the world around me and I see brokenness. I see disrespect for human life, greed, hate. The only thing in which I still see beauty is nature, but everything else has lost its luster. My relationship with God has never been so complicated. In one breath, I’m asking Him to take Eleanor and me home, end this earthly existence that’s engulfing us with sorrow, despair, uncertainty, and a promise of a future that – no matter what – will be less than what we would have had. In another breath, I’m asking Him to protect our home when it’s 4 a.m. and I hear a noise outside. 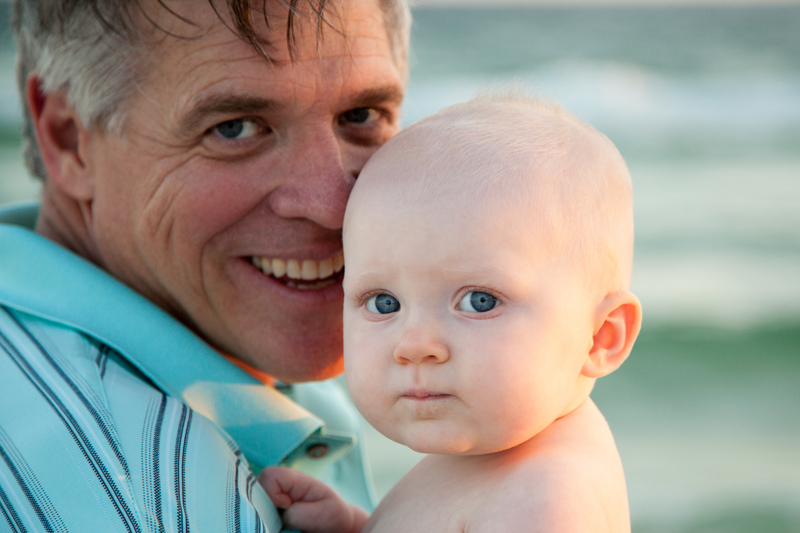 When I learned that Ted’s life had been taken away, I was sitting in a hospital chapel, holding my 1-year-old in my lap. With curious eyes, she was looking at the ER surgeon as he told us with tears in his own that her father died on impact. For the weeks that followed, I grasped onto the fact that Ted didn’t suffer. I told myself that he wasn’t gasping for breath, fighting to survive through the agony so he didn’t abandon the ones who were relying on him. Because that’s who Ted was, he had such an innate drive to protect his loved ones. It was more than I could bear to imagine him pleading with God to keep him alive so he wouldn’t leave me as a young widow to raise his baby alone. So I let myself believe the surgeon that Ted went quickly and peacefully. As time passed and bills from the hospital, ambulance, and surgeon began rolling in, I saw all sorts of procedures that were administered. They gave him a tracheotomy to help him breathe, epinephrine to jump start his heart, CPR, and the list goes on. It was such a sterile, itemized way to be shown the attempts that were made to save Ted’s life, save our family’s future, and save the love of a lifetime. But no matter how skilled these men were, they were merely men. This was the moment that required a miracle from God. One of my prayers through this entire tragedy is that many more people will be led to Christ. Through this horrifying illustration of the fragility of life, through the beautiful outreach that our church organized in honoring my beloved Ted, and through the testimony of our family and how we’ve banded together during this time – I’ve prayed that more people than I’d ever know would turn their lives over to God. But what better way to witness to others than for Ted’s life to have been spared by divine intervention? And who better to give this witness than Ted? He was loved and respected by so many and he captured the attention of those around him. But most importantly, Ted was never afraid to demonstrate his faith to unbelievers. He was confident in his faith and wanted to lead others to God as well. Ted would have lived the rest of his life giving all the glory to God. His story would have turned so many hearts to our Father, and what better purpose in life is there? But that didn’t happen. There was no divine intervention. Instead, Ted’s life was taken, and the man who killed him walked away with very little consequence. In the dark hours of the night, I picture God looking down at my precious husband lying on a gurney on the side of the road while the EMTs work feverishly to save his life, and He just watches. He watches as my child’s father slowly slips away from this realm and into his Heavenly home. And He’s okay with that. These are the moments when I ask him to just take us too. Let us be a family again. Let us come home.